Since it’s Friday, it’s Free Chocolate Friday. 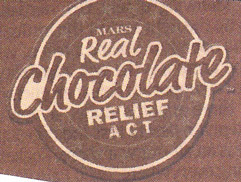 As regular readers know, every Friday through the end of September is Free Chocolate Friday, meaning that under Mars’ “Real Chocolate Relief Act” promotion, you can get a coupon for a free Mars chocolate candy bar. Go here for the details and link to free chocolate.